ARRL Headquarters will be closed Monday, May 25, in observance of Memorial Day. There will be no W1AW code practice or bulletin transmissions that day. ARRL Headquarters will reopen Tuesday, May 26, at 8 AM (EDT). We wish everyone a safe and enjoyable holiday weekend! Another Dayton Hamvention® is in the log, and the sponsoring Dayton Amateur Radio Association (DARA) already has begun counting down to the 2016 event (May 20-22, 2016). While Hamvention traditionally provides an ideal occasion for Amateur Radio manufacturers to introduce their latest offerings, new gear was in somewhat shorter-than-usual supply at the 2015 event. On the other hand, this may have shifted attention toward Hamvention's other activities, such as the always-popular forums and, of course, the flea market. There were scattered showers on all 3 days. "Great weekend!" was how ARRL CEO David Sumner, K1ZZ, summed things up. He described visitors as "friendly" and said there was a lot of anticipation for the geosynchronous satellite package that AMSAT plans to put into orbit in 2017. ARRL Publications Manager and QST Editor Steve Ford, WB8IMY, described Hamvention's opening day as "extremely crowded for a Friday." Traffic at ARRL EXPO was brisk, and the ARRL Lab's spectral purity testing table saw "steady traffic with long lines at times," he added. NASA Astronaut Mike Fincke, KE5AIT, a special Hamvention guest, stopped by to tour ARRL EXPO and to chat with ARRL President Kay Craigie, N3KN, and visitors. To celebrate 100 years of QST, ARRL introduced a commemorative edition of the first QST -- the December 1915 issue. The reprint was free for those joining, renewing, or extending their ARRL membership at Hamvention. ARRL Life Members could obtain a free copy. Those unable to attend Hamvention may obtain copies directly from ARRL for $9.95 each. Hara Arena could look like this for the 2016 Hamvention. Something to look forward to in 2016: Hara Arena posted artist's depictions of renovations to the Hara complex that are expected to be completed by next year's show. New products touted at the 2015 Hamvention included the K3S transceiver from Elecraft -- an upgrade of its very popular K3. Expected to ship by mid-June, the K3S is the "second-generation, software defined superhet transceiver," the manufacturer said on its website. 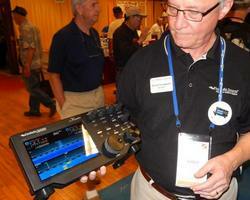 "We've upgraded nearly every subsystem, improving performance and adding many new features," Elecraft said. The new Elecraft K3S with its hood off. New features include a quieter synthesizer, "unequaled" strong-signal performance, and "exceptional" transmitter purity. There's also a second preamp, a new LCD bezel, and a "soft-touch VFO A knob with improved grip." FlexRadio's Gerald Youngblood, K5SDR, shows off the new Maestro console. the unit combines a high-definition 8-inch touch display and is "ergonomically designed." Astronaut Mike Fincke. "These 16 young hams are already contributing to the second century of our Amateur Radio Service!" said ARRL Education Services Manager Debra Johnson, K1DMJ. Galen Wilson, KF5BET, whose daughters Abbi, KF5BEW, and Kendra, KF5FYS, were among the forum presenters, expressed appreciation to Perry and to the League "for the awesome support given to the forum, the presenters, and the youth." Wilson said his family "was overwhelmed with the magnitude of support" the youngsters received during their first Hamvention. "This was truly an experience of a lifetime for my girls," he added. At its forum, AMSAT announced that the launch of its Fox-1 CubeSat has been delayed until late September. 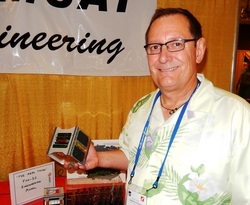 AMSAT Vice President-Engineering Jerry Buxton, N0JY, also said that AMSAT's planned geosynchronous satellite package would offer uplinks on 5 GHz and downlinks on 10 GHz. Buxton explained that the geosynchronous footprint will not be absolutely fixed; some variation may require some up/down movement of the user's dish at certain times. Even in the worst case, he told the AMSAT Forum, a user with a fixed antenna would still be able to enjoy several hours of access each day. The transponder for the new satellite will be software defined and capable of supporting many different modes, including analog SSB. The satellite's potential footprint could extend over the US from the Mid-Pacific to Africa. AMSAT has accepted the opportunity to be a "hosted payload" on a spacecraft that Millennium Space Systems (MSS) of California is under contract to design, launch, and operate for the US government. At the Saturday ARRL Member Forum moderated by ARRL Great Lakes Division Director Dale Williams, WA8EFK, President Craigie discussed "The Amateur Radio Parity Act of 2015 -- H.R. 1301 -- and encouraged members to recruit supporters among their congressional representatives. ARRL Regulatory Information Manager Dan Henderson, N1ND, also met with visitors to ARRL EXPO to discuss the legislation. 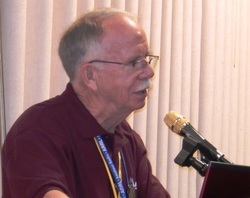 ARRL Chief Technology Officer Brennan Price, N4QX, talked about ARRL and Amateur Radio's interests at the upcoming World Radiocommunication Conference 2015 (WRC-15), which he will attend in November. High on the list was the possibility of a contiguous 5 MHz secondary allocation somewhere within the range 5250 kHz through 5450 kHz. He also discussed the issue of vehicular radars in the 76-81 GHz range, the topic of a current FCC proceeding. 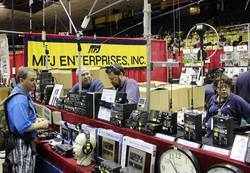 The MFJ booth in Hara Arena: MFJ introduced some new products at Hamvention. Named as Hamvention Amateur of the Year was top-tier contester Tim Duffy, K3LR, who is also ARRL Western Pennsylvania Section Manager. Hamvention's Special Achievement Award went to Tom Medlin, W5KUB, and the Technical Excellence Award to the Rev George Dobbs, G3RJV. The Orlando Amateur Radio Club (OARC) was Club of the Year. 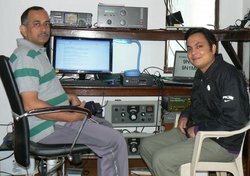 Amateur Radio emergency operations on 20 meters, resumed in the aftermath of the second Nepal earthquake, have again been suspended, according to Jayu Bhide, VU2JAU, the Amateur Radio Society of India National Coordinator for Disaster Communication. Bhide said he discussed the situation on May 17 with Satish Kharel, 9N1AA, and that the decision was based on the fact that all systems in the affected region "are working normally." VU2JAU, 9N1AA, and others have been among those active on 14.210 MHz since the initial earthquake on April 25. Kharel told IARU Region 3 Disaster Communications Committee Chairman Jim Linton, VK3PC, this week that aftershocks continue. "I hope there would not be any bigger than [magnitude 6] in the coming days. Though the situation in the city area is reasonable, it is extremely bad in villages. Some 90 percent of the rural houses are fully destroyed," he said, adding that monsoon season starts in about 3 weeks. Kharel said major roads to Kathmandu Valley have been shaken by tremors, causing minor landslides at various points. "Geo experts are claiming once rain begins, parts of these roads will swept [away], and Kathmandu could be cut off for weeks," he added. 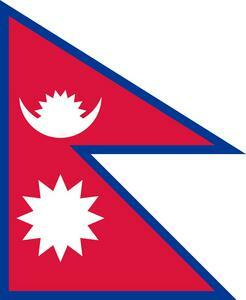 Amateur Radio relief activity in Nepal had begun winding down before a magnitude 7.3 earthquake shook parts of the Himalayan nation on May 12, collapsing buildings and killing dozens in a region that's still trying to recover from the much stronger earthquake on April 25. The latest quake revived the ham radio effort. Centered some 50 miles east-northeast of the Nepalese capital of Kathmandu and near the border with Tibet, the temblor was felt in India and Bangladesh. The US Geological Survey considers the May 12 tremor as an aftershock of the magnitude 7.8 earthquake on April 25. The Army Military Auxiliary Radio System (MARS) has been continuing to gather information and statistics on the earthquake tragedy in Nepal. Sanjeeb Panday, 9N1SP, has been passing traffic to Tim McFadden, T6TM/ KB2RLB, a MARS operator in Afghanistan. Among other information, Panday told McFadden that 8250 people died as a result of the earthquakes and nearly 480,000 residences were destroyed. Another 263,000 were damaged. "Once Tim receives Nepal disaster traffic he has been preparing SPIREP and COMSPOT reports as needed and then relaying them through MARS networks to HQ, Army MARS, and me," said Daniel Wolff, KA7AGN, the MARS EUCOM/CENTCOM/AFRICOM Regional Director. "He also has been posting the information to the Nepal disaster APAN [All Partners Access Network] website." Ironically, the scenario for last year's MARS "Pacific Endeavour-14" regional disaster response was a major earthquake in Nepal. Read more. One incumbent Section Manger overcame a challenge to win his bid for a new term of office, while two SM candidates who ran unopposed will assume office this summer. Ballots in the two-person race in the ARRL Utah Section were counted on May 19 at ARRL Headquarters. Incumbent Section Manager Mel Parkes, NM7P, received 342 votes, while Pat Malan, N7PAT, of South Jordan, garnered 280 votes. Parkes, of Layton, has served as the Utah Section Manager since 1999. The Maryland/DC Section will have a new Section Manager starting in July. Marty Pittinger, KB3MXM, of Owings Mills, was the only nominee for the post, now held by Jim Cross, WI3N, who decided not to run again after serving since January 2006. Pittinger is currently the Affiliated Club Coordinator in Maryland/DC. He also serves as a Public Information Officer, Official Relay Station, and Net Manager. A new Section Manager also will be taking the reins in West Texas. Ron Harden Jr, KB5HGM, of Baird, was the sole candidate for the office. He has been serving as Affiliated Club Coordinator and as an Emergency Coordinator in West Texas. Incumbent Bill Roberts, W5NPR, decided not to run for another term after serving since 2011. Five sitting Section Managers faced no opposition in the spring election cycle and will begin new 2-year terms on July 1. They are Peter Stohrer, K1PJS (New Hampshire); Richard Krohn, N2SMV (Northern New Jersey); John Bigley, N7UR (Nevada); Bob Beaudet, W1YRC (Rhode Island), and Dan Pruitt, AE6SX (San Joaquin Valley). Amateur Radio station WX4NHC at the National Hurricane Center in Miami will conduct its annual station test on May 30, 1400 until 2200 UTC. The purpose of this event is to test Amateur Radio station equipment, antennas, and computers in advance of the 2015 hurricane season, June 1 through November 30. "This event is will be good practice for ham radio operators worldwide, as well as for National Weather Service (NWS) staff to become familiar with Amateur Radio communications that are available during times of severe weather," said WX4NHC Assistant Amateur Radio Coordinator Julio Ripoll, WD4R. WX4NHC also will conduct operator training. WX4NHC will make brief contacts on various bands and modes, exchanging signal reports and basic weather information, such as "sunny" or "rain," with any and all stations. WX4NHC will operate on HF, VHF, and UHF, including APRS on 2 and 30 meters and WinLink (subject line must contain "//WL2K"). "We will try to stay on the recognized Hurricane Watch Net frequency of 14.325 MHz most of the time and announce when we QSY," Ripoll said. "Due to space and equipment limitations, we will have two to three operators per shift," he added. "We cannot be everywhere and on every mode at the same time." He suggested locating WX4NHC by using one of the spotting networks, such as DX Summit. 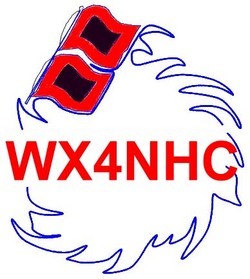 WX4NHC also will be on the VoIP Hurricane Net (VoIP-WX) from 2100 until 2200 UTC and on IRLP node 9219 and EchoLink WX-TALK Conference node 7203. The station also will operate on VHF and UHF repeaters in South Florida. QSL cards are available via WD4R with an SASE. Do not send cards directly to the National Hurricane Center. Massachusetts Institute of Technology (MIT) professor Dava Newman, KB1HIK, has been sworn in as the deputy administrator of NASA. President Barack Obama appointed Newman last October, and the US Senate confirmed her appointment on April 27. The swearing-in took place on May 15 in her MIT office in Cambridge. Newman is Apollo Professor of Astronautics and Engineering Systems and the director of the Technology and Policy Program at MIT. She started her official duties as NASA's new deputy administrator on May 18 at the agency's headquarters in Washington, DC. "I'm very excited to be at NASA," said Newman. "I'm looking forward to being a part of the agency's work to expand humanity's reach into space, advance our journey to Mars and strengthen America's leadership here at home." 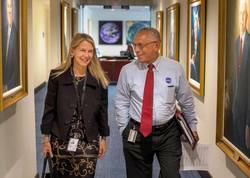 NASA Administrator Charles Bolden, ex-KE4IQB, said he's long admired Newman. "Her talents and skills as an educator and technological innovator will bring a new energy to our NASA leadership team, and I'm ecstatic to have her on board," he said. Newman had been on the MIT faculty since 1993. Her research has included modeling human performance in low and microgravity conditions, examining the dynamics and control of astronaut motion, and the development of assisted walking devices for the physically handicapped. Possibly her most prominent project has been the development of the BioSuit, a skintight spacesuit that would give astronauts unprecedented comfort and freedom in exploration of planetary surfaces and extra-vehicular activity. 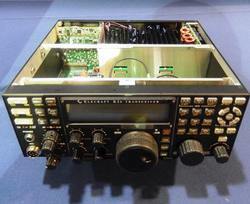 "Ham Radio," Europe's largest Amateur Radio event, celebrates its 40th anniversary this year. The annual gathering, known to most simply by its location -- Friedrichshafen -- takes place June 26-28 on the shore of Lake Constance in southwest Germany. The exhibition in 2014 attracted more than 17,000 visitors, including contingents from the ARRL and the International Amateur Radio Union (IARU). The Deutscher Amateur Radio Club (DARC) is a Ham Radio cosponsor, and its theme for this year's gathering is "Space stations, satellites, reflections: Amateur Radio contact with space." The DARC celebrates its 65th anniversary this year. Representing the ARRL in Friedrichshafen will be League President Kay Craigie, N3KN; CEO David Sumner, K1ZZ; Membership Manager Diane Petrilli, KB1RNF, and Assistant Field Services and Radiosport Manager Norm Fusaro, W3IZ. ARRL volunteer Hal Turley, W8HC, will assist with DXCC card checking. Heading the IARU team will be President Tim Ellam, VE6SH/G4HUA. He'll be accompanied by IARU Vice President Ole Garpestad, LA2RR, and Secretary Rod Stafford, W6ROD. Friedrichshafen will host a Contest University (CTU) session on Friday, June 26, for beginners and pros. The instructors include some of the world's leading radiosport enthusiasts. Some 200 Amateur Radio exhibitors from more than 30 countries, including the US, are expected to attend the show to exhibit their wares and services. Maker World -- a gathering for build-it-yourselfers, tinkerers, and experimenters -- once again will take place at Friedrichshafen at the same time as the Ham Radio exhibition. Ham Radio 2015 will include a number of activities aimed at youth. An Amateur Radio transmitter hunt, or fox hunt, will be back again this year on Sunday morning. A ham youth camp will offer youngsters, teenagers, and adults up to age 27 a chance to explore the exhibition and get to know other young people interested in Amateur Radio. Last year's ham youth camp attracted some 120 young people (the registration deadline is June 10). The popular Ham Rally will take place on Friday and Saturday, June 26 and 27, offering a varied program for young radio enthusiasts. To commemorate the 40th anniversary of Ham Radio, the venue, Messe Friedrichshafen, will present a retrospective featuring photographs, exhibit items, and recollections from the event's past 4 decades. Contact Messe Friedrichshafen to submit items or for more information. As reported in "The K7RA Solar Update" and the W1AW Propagation Bulletin (ARLP020/2015) for Friday, May 15, Dave Pedersen, PJ4VHF/N7BHC, on Bonaire copied a 2 meter CW signal from the D4C/B beacon on 144.436 MHz at Cape Verde via tropospheric ducting on May 6 (0100-0230 UTC). Bonaire is in the Caribbean just north of Venezuela, while Cape Verde is off the coast of Africa, west of Senegal -- a distance of nearly 3000 miles. The D4C beacon runs 20 W and is about 750 meters above sea level. Pederson was able to confirm the transmission with the beacon operator, HB9DUR. He was using a Kenwood TS-2000 and two 13 element Yagis. A recording has been posted. Click on "Download This File." "I had parked my VHF array pointing west for minimum wind resistance," Pederson told ARRL Propagation Editor Tad Cook, K7RA. "Tuesday evening [May 5] I was doing some paperwork in the shack and rotated the beams back east at 0100 UTC to prepare for listening all night. To my amazement, I started copying CW while the beam was still 30° off the D4C bearing." CQ magazine has announced its 2015 Hall of Fame inductees. The CQ Amateur Radio Hall of Fame honors individuals, licensed or not, who have made significant contributions to Amateur Radio, to their professions, or "to some other aspect of life on our planet," CQ said. Tim Allen, KK6OTD -- Actor and star of the ABC comedy "Last Man Standing," on which he portrays a ham, Mike Baxter, KA0XTT. Charles Apgar, ex-2MN (SK) -- Uncovered German spy transmissions from Telefunken shore station WSL in New York during World War I, before the US became involved in the hostilities. Dr Dan Benishek, KB8TOW -- Member of Congress from Michigan, medical doctor, and advocate for veterans. Olof Lundberg, G0CKV -- Leader of the communications satellite industry for a quarter-century. Bre Pettis, W2BRE -- 3D printing pioneer and founder of MakerBot. Alvino Rey, W6UK (SK) -- A leading musician of the swing era, Rey combined his love for music with his love of radio to transform the music world. Bob Twiggs, KE6QMD -- Co-inventor of the CubeSat design model. Greg Walden, W7EQI -- Member of Congress from Oregon and chairman of the House Communications and Technology Subcommittee. Joko "Jokowi" Widodo, YD2JKW -- President of Indonesia. The CQ DX and Contest Halls of Fame honor those amateurs who not only excel in personal performance in these major areas of Amateur Radio but who also give back to the hobby in outstanding ways. Yasuo "Zorro" Miyazawa, JH1AJT -- A DXer, DXpeditioner, educator, and philanthropist, Zorro Miyazawa is the founder and CEO of the Seisa Group, which operates schools in several countries, and is founder/CEO of the Foundation for Global Children. Michael Wells, G7VJR -- Founder of ClubLog, an online DXpedition log-hosting tool that has changed the face of DXpedition operating. Doug Grant, K1DG -- President of the 2014 World Radiosport Team Championship (WRTC) Board and a world-class contester, Grant has shared his knowledge and skills with others. He has competed in five WRTC events, medaling three times. Ward Silver, N0AX -- A contester for more than 4 decades, he helped to found the WRTC competitions in 1990 and is president of the Yasme Foundation. 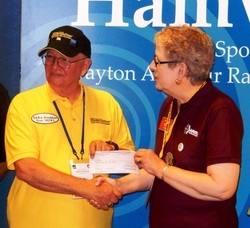 Formal inductions to the CQ Contest and DX Halls of Fame took place at Dayton Hamvention. ARRL VHF/UHF Contests Now Allow Self-Spotting: Beginning with the ARRL June VHF Contest, June 13-15, participants will be allowed to spot themselves on spotting networks. These changes were made to encourage greater participation and band utilization. For more information on these rule changes, see General Rules for ARRL Contests Above 50 MHz (specifically, item 1.16). Self-spotting announcements "shall be limited to call sign, location, band or frequency, mode, and -- if applicable -- transmitting sequence and listening direction to coordinate antenna peaking prior to initiation of the contact and to explain contest rules, such as the exchange required." Parachute Mobileers to Operate on 10 and 2 Meters: On May 31, ham skydivers Mark Meltzer, AF6IM, and Michael Gregg, KF6WRW, will be making 10 and 2 meter contacts while "under canopy," starting at 12,000 feet. Jumper-carried APRS with GPS, heart rate, and blood oxygen data will be used. Special Parachute Mobile "Mission 20" QSL cards will be issued for ham contacts and listener reports. 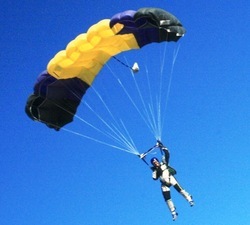 Jumps will commence in Byron, California, at around 11 AM Pacific Time and continue until sunset, weather permitting. Shift from Navy-Marine Corps MARS Under Way: It's been reported that some 60 US Navy-Marine Corps Military Auxiliary Radio System (MARS) members had transitioned to the US Army MARS program within a week of the announcement earlier this month that the US Department of Defense was phasing out US Navy-Marine Corps MARS and moving its operational mission to other MARS service branches by the end of September. MARS volunteers are Amateur Radio operators who provide auxiliary or emergency communications to local, national, and international emergency and safety organizations, as an adjunct to normal communications. Army MARS Headquarters has been processing most applications in 1 day via e-mail. State directors first approve the digital membership form and forward it to US Army MARS Headquarters in Fort Huachuca, Arizona, which assigns the call sign and e-mails the license directly to the applicant. One new member was able to join his first Army MARS net on the same day he filed for transfer. Tad Cook, K7RA, Seattle, reports: Sunspot numbers drifted below 100 over the May 14-20 reporting period, and so the average daily sunspot number declined from 146.9 over the previous 7 days to 92.1. Average daily solar flux dropped from 156.3 to 123.3. You can see the decline in solar flux in addition to the decline in predicted numbers by downloading the NOAA/USAF spreadsheet, which shows the daily readings and the shifting 45-day predictions. The spreadsheet indicates that the predicted solar flux is 105 on May 21, 100 on May 22-23, 95 on May 24-28, 105 on May 29-30, 110 on May 31, 115 on June 1, 120 on June 2-3,, 125 on June 4, 130 on June 5-6, 120 on June 7-12, 110, 115, 105, and 95 on June 13-16, 90 on June 17-19, 95 on June 20, and 105 on June 21-26. This value peaks again at 130 on July 2. ARRL Field Day is June 27-28, 2015, when the predicted solar flux is 110 and 115. Predicted planetary A index is 8 on May 21, 5 on May 22-28, 8 on May 29-30, 5 on May 31 through June 1, 15 and 10 on June 2-3, 5 on June 4-6, 12 on June 7, 25 on June 8-9, 12 on June 10, 5 on June 11-12, then 8, 15, and 12 on June 13-15, and 5 on June 16-24. This spreadsheet shows predicted values and more going out 45 days. In Friday's bulletin look for reports from readers and an updated forecast. Send me your reports and observations!